Debby put on her red shoes.. The genesis and evolution of this blog has been on my mind. Some years ago I set up a page within the FleetFire Timbers website called What’s News. The page was designed to look like a newspaper. I’d add something now and then; adding content was a challenge because of the cumbersome design. It was my chiropractor, Jason Steinle (and great narrator of Ancient Treasure – The Remake), who introduced me to blogging and recommended WordPress. What’s News changed to a blog within the FFT website. Around the same time Nate and Rick came home with an off-road vehicle, a Suzuki Samurai. After a photo shoot of the Trailer Queen, Nate went to Facebook and quickly shared the photos. Facebook wasn’t yet a household name. Show me that again! He did, but I didn’t really grasp the concept. Time marched on. I began noticing ‘interactive’ websites, which I later learned ran with Web 2.0 technology. I joined Facebook with the intent of learning more and discovered my nieces, nephews and their children. Bonus! Listening to podcasts, particularly photography podcasts, I was introduced to Twitter before it, too, became a household word. With some of this newfound knowledge the website transitioned into a blogsite. At first I wrote a lot on the blog, often waking up extra early with words pouring out of me. I took photos specifically for the blog. Somewhere along the way life and time created stumbling blocks. Or perhaps….writing blocks. In 2009 every extra minute was spent working on Ancient Treasure – The Remake, gearing up for the presentation at that year’s National Specialty. Was it then inspiration left me?? From my perspective – and I suspect from yours too – the blog became mundane. No more! I am once again feeling inspired! I am ready to write about things from dogs to gas stations to photography to dogs to gardening to dogs to reading to dogs. And whatever else I feel like writing about. I won’t be writing every day, but I’ll write at least twice a week and include photos too. I am ready to make the blog better than ever, my own version of Artful Blogging. David Bowie’s “Let’s Dance” has been playing over and over again in my head this week. 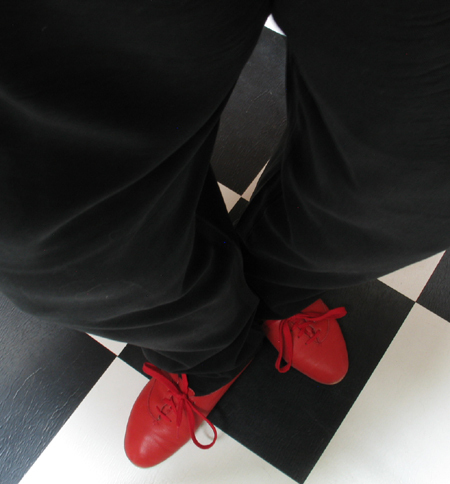 “Let’s dance put on your red shoes and dance the blues.” The blues. Ah, music that sings to my soul. Red is my favorite color. I had a dog named after this song. Champion Fleetfire Put On Your Red Shus. His call name was Bowie.